Rain that hits the side of an outside wall may cause water stains. Rain can also seep through leaky log cracks or windows and then onto interior walls. 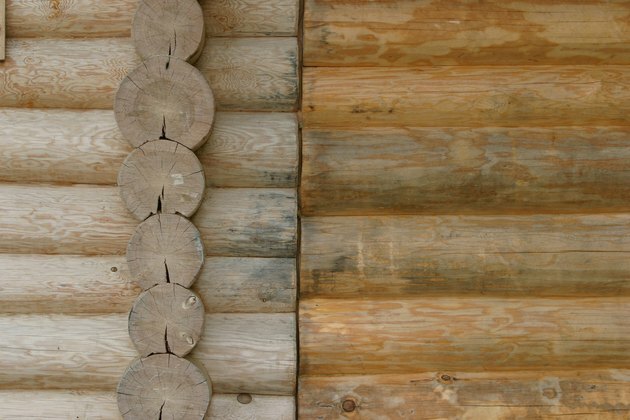 Water exposure to log walls can leave white or dark colored rings or wavy lines when the water dries. White stains on logs are caused by water penetrating the finish, but not the actual log. Dark or black stains are indicators that water has penetrated either the finish or unfinished surface and into the actual log. Fortunately, any types of water staining can easily be removed from log walls. Take a small bowl and fill it up with lemon oil. Place the steel wool pad inside the bowl and allow it to sit for a few minutes to ensure saturation. Pick up the steel wool pad and squeeze out any remaining oils. Gently rub the pad over the water stain. The lemon oil will help prevent the pad from digging into the wood and scratching by acting as a lubricator. Re-soak the steel wood pad and repeat for each water stain that is white in color. Read the instructions to the wood or oil soap. Wash the previously white water stained area on the log wall with soap per the instructions. Gently sand the dark water stain with the fine grit sand paper to remove wood finish or varnish. Sanding is necessary to remove the finish or varnish in order to reach stains that have penetrated into the actual log. 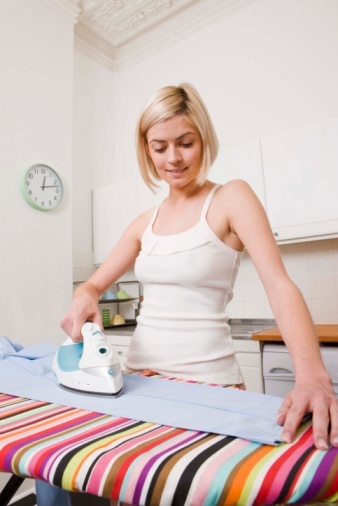 Wipe off the sanded area with a lint free cloth to remove debris. Put on rubber gloves and old clothing and then fill a small bowl up with bleach. Dip a small paintbrush into the bleach and brush onto the stained area. Do not overly saturate the wood. Allow the bleach to sit for two to three hours and reapply to the stain. Reapply as often as necessary until the dark stains are completely gone. Apply a matching color stain or varnish to the log wall by following the instructions that are found on the product packaging.